Benahavis is perhaps one of the lesser known regions in the Province of Malaga. The Municipality of Benahavis is located between the areas of Marbella, Ronda and Estepona covering an area of 145km2. Despite being less well known, the lines between these areas blur and in fact Benahavis real estate has some of the best available offerings and is extremely sought after by property buyers wanting to live near Marbella, on the Costa del Sol. The wider area of Benahavis Municipality incorporates some of the most exclusive developments in Spain, including la Zagaleta. If the Costa del Sol is considered to be the California of Europe, then La Zagaleta is it´s Hollywood Hills. An exclusive, luxury, gated community that is home to the rich and famous on a mountainside location with breath-taking views and properties to match. Opulent villas with endless bedrooms, bathrooms, cinema rooms and private gyms as standard that require film-star sized chequebooks to purchase. So exclusive is La Zagaleta, that buyers are interviewed before they can purchase there. Residents of this community value their privacy greatly and benefit from 24 hour security and many onsite facilities which are available only to them; La Zagaleta offers two golf courses, private tennis courts and even a riding club. For luxury, privacy and seclusion, this glamorous location is hard to beat. Another extremely popular high-end development in Benahavis is el Madroñal, with impressive villas on large plots complete with private swimming pools and stunning coastal views. Just a short drive from San Pedro, this secure community is surrounded by trees and benefits from a low build density. 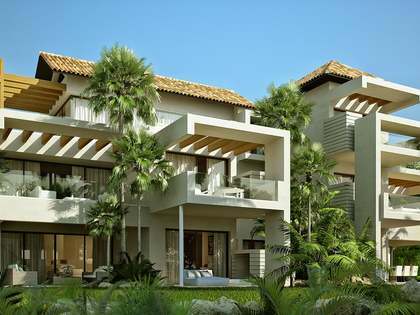 Luxury villas here, are spacious and well laid out. 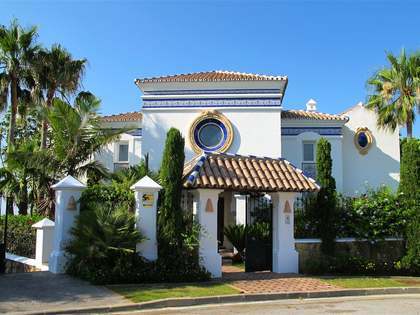 However, these two luxury communities are not the only ones that offer villas for sale in Benahavis. The very well-known La Quinta resort is also located in the Benahavis area and close enough to enjoy the glamour and nightlife options Marbella and Puerto Banus offer. La Quinta, is one of the most golf popular courses in the area, there is a Westin Hotel and Spa, and the whole community is well connected, being just 5 minutes to San Pedro. In fact, many people are unaware that Benahavis and Nueva Andalucía border each other. Nueva Andalucía has almost no more available land for construction so the houses for sale in Benahavis tend to be newer, and more modern. Given the geographical proximity of the two areas also, it worth noting that it takes the same time to get to Marbella from either, making Benahavis a great choice for home buyers. 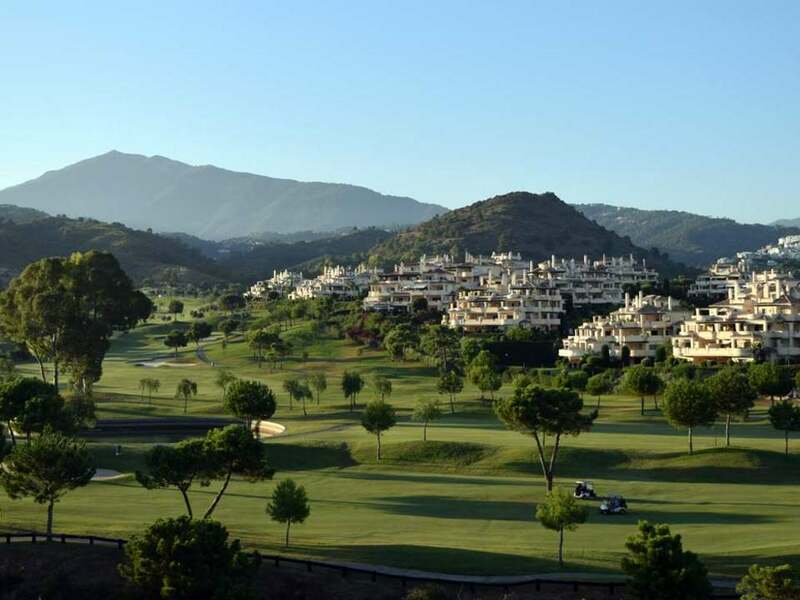 Los Arqueros Golf and Country Club is another of the Benahavis favourites, with its stunning views of the coast. La Heredia is a delightful, colourful village, full of authentic flavour and nestled into the hillside. Both can be found on the way to Ronda. These are areas of peace and tranquillity, benefitting from the outstanding scenery and facilities; Golf is a major draw in the area here with over a dozen top quality courses available. In fact the municipality is often visited by professional football teams from Northern Europe during pre-season due to the proximity thanks to the first class training facilities and golf courses in the area. Well known and developers understand the potential and now there are Benahavis apartments for sale with amazing views from around 360,000 euros. Huge infrastructure investment is being carried out in the municipality, and a BREEAM certified eco-resort is under way, the first of its kind in Spain. This long term development will provide buyers with a new modern style of healthy living with some of the best scenery on the coast. 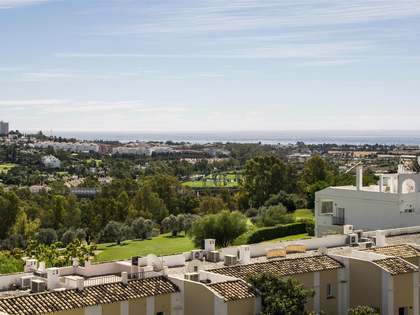 In fact all the new developments in Benahavis are designed with views in mind, sea facing and sunny. The Municipality of Benahavis is quite different to the other areas on the Costa del Sol; it is ideal for anyone seeking somewhere peaceful but still within easy reach of bustling seaside towns. Spectacular views of the coast and countryside, as well as the low density development mean that people quickly fall in love with its rustic charm. It is an ideal location, close to Marbella, San Pedro and the beach, with outstanding views and properties to suit even the most demanding of buyers. An added bonus is easy access to the A7, AP-7 and N340 motorways and just 45 minutes to both Málaga and Gibraltar airports. The picturesque mountain town of Benahavis itself is about 7km from the coast is typically Andalusian, whitewashed and Moorish, and often called the "dining room of the Costa del Sol" with restaurants such as El Castillo, Los Abanícos and La Torre and it even its own cookery school with a restaurant for enjoying and learning all of the secrets of the Mediterranean diet. The road to the town meanders alongside the Guadalmina River and on arrival one finds the town itself - one of the highest in Malaga - surrounded by natural parkland set against a spectacular mountainous backdrop. Benahavís is home to The Gran Benahavís, a 5 star Cortijo style hotel, with its fantastic facilities all set in a majestic location. Lucas Fox proudly offers an extensive selection of Property for sale in Benahavis, featuring high-end villas, exclusive apartments and penthouses as well as new cutting edge developments. Speak to us today to find the perfect property for you.